Seattle - The first trial over claims that Johnson & Johnson unit Synthes Inc. used its bone cement in spinal surgeries without regulatory approval on patients that died on the operating table - allegations that landed company executives in prison - is set to begin this week in Washington State court, and will be webcast live gavel to gavel by Courtroom View Network. The families of two women who died during supposedly routine back surgery sued Synthes and subsidiary Norian Corp., along with physician Jens Chapman and the University of Washington, claiming that the company and hospital pressed ahead with unauthorized clinical trials of Norian XR bone cement to treat vertebral compression fractures, despite supposedly knowing the cement wasn’t approved for that use and could leak into the bloodstream causing fatal clotting. Neither Reba Golden, who died in 2007 nor Joan Bryant, who died in 2009, were informed that the U.S. Food & Drug Administration had not approved Norian’s bone cement for “off-label” use on the spine, according to their complaint. Both operations took place after the FDA informed Synthes in 2007 that its bone cement must include a warning label stating it is not to be used on the spine. Norian originally developed its bone cement for use in skull and arm bone surgeries, but Synthes acquired the company in 1999 and soon began making plans to modify the cement for use in spinal procedures. According to court filings the companies knew as far back as 2002 that the bone cement posed a clotting risk when used on the spine. Pigs injected with the cement supposedly died in minutes, and test tubes of human blood quickly clotted when exposed to the modified compound. In 2009 Synthes and Norian, along with four top executives, were indicted on charges of conducting illegal clinical trials on humans. Joan Bryant’s surgery took place 13 days after the indictments were handed down, which her attorneys have argued in court filings was a clear signal that the bone cement should not have been used on her spine. In 2010 the executives entered guilty pleas and received prison sentences, and the companies agreed to pay over $23 million in fines and penalties. At least five deaths had been linked to the bone cement as of that year, and the company has also been sued in federal and state court in Pennsylvania and California, respectively, with at least one case being settled through private mediation. The closely-watched trial in Seattle is taking place before Judge Jim Rogers, and opening statements are scheduled for June 27. 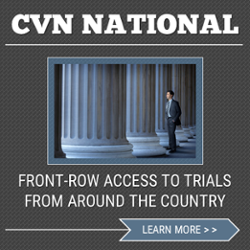 CVN will be webcasting the full trial live from the start of opening statements forward. The plaintiffs are represented by the Washington State law firm Friedman Rubin and by Rush Hannula Harkins & Kyler LLP. Synthes is represented by Bennett Bigelow & Leedom PS and by Martin Clearwater & Bell.